American Master Bruce Alberston is one of the most popular chess writers in the world today. His books, including the first volume of Chess Mazes, have been instructing and entertaining chessplayers worldwide for more than two decades. He lives with his wife in New York. When the first volume of Chess Mazes was released, it was an immediate hit with both chess instructors and students. It was a completely new kind of chess puzzle to help develop your chessplaying visualization skills. 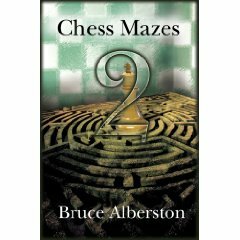 In Chess Mazes 2, author Bruce Alberston has created hundreds of more fascinating chess mazes. This book is geared for intermediate and advanced beginners. Designed to keep pace with a student's increasing development, the chapters appear in progressive order of difficulty, and form kind of a chess course in itself. As German International Grandmaster Karsten Müller observed in his Introduction to the first volume, solving Chess Mazes puzzles is excellent training to avoid one-move blunders!